April 2017 - Don't miss our technical sessions at The Haystack Connect 2017 Conference May 8 - 10 in Tampa, Florida. We’ll be discussing several topics, including how to use SSL and VPNs to provide security. Project Haystack makes it easier to analyze the data from various devices by implementing tagging. The data is accessible remotely via HTTP but is that secure enough? Implementing HTTP over SSL on the device can help alleviate this issue by providing encryption. The use of HTTPS also provides security by ensuring the identity of the device with the use of certificates. But there is some burden on the end device for implementing SSL and depending on the device memory, it may not be possible to add SSL. The use of a separate device providing VPN in this scenario can help. VPNs can provide security and also help in hiding your end devices and infrastructure. VPN involves creating a secure encrypted connection generally referred to as VPN Tunnel. There are multiple implementations of VPNs like IPSec, L2TP, PPTP but the focus will be on the use of OpenVPN. OpenVPN is open-source and can be used for either point-to-point or site-to-site connections. The use of mediated VPN server, where the VPN server running on a machine on the internet, eliminates the need for public IP address on the client devices. Learn more about different VPN implementations during the technical session at Haystack Connect. View the full Technical Program and the full lineup of Speakers. Do you still need to Register to attend Haystack Connect 2017? Register today at www.haystackconnect.org/register. 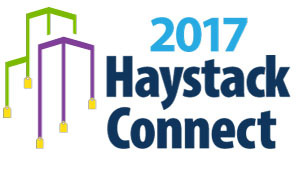 If you have any questions about Haystack Connect 2017, please contact the Conference Manager, Robin Bestel at robin@haystackconnect.org.